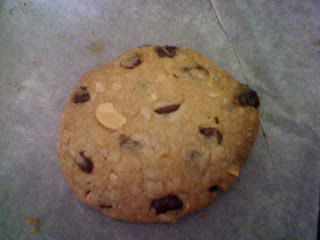 These cookies are not the best cookies ever. They are not rich and neither are they fantastic whatsoever. However, when an allergic boy pops it in his mouth, he says these are the best chocolate chip cookies anyone every baked for him. My colleagues at work loves it. 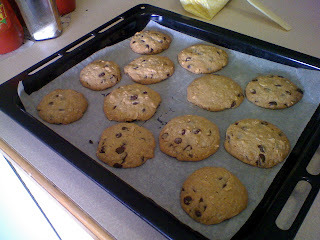 They love the crunch from the nuts and the generous chocolate chips.These cookies are butterless! Only shortening are used here. I know it's unhealthy since shortening contains so trans-fat but I'm only gonna do this one for the sake of people who are allergic to butter! Anyone knows where to get good shortening? I'd prefer lard over shortening sometimes due to this reason. 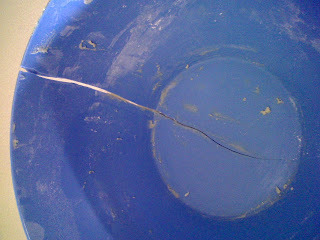 However, I would have chose to break a plasticware rather than a glassware so I guess that mixing bowl was just unlucky. It was my favourite because it is a conveniently deep bowl. I don't think anyone would want a recipe for this unless you are only allergic to butter or you are running out of butter in the pantry so I'm gonna keep this post short. As I've said before, I'll try to update this little dessert blog of mine on a daily basis. I wish I could be half as disciplined when it comes to revising my subjects. Aaron must be dead disappointed when he saw new updates coming into his mailbox again from my blog! Sorry honey but I'll study when I feel like it! 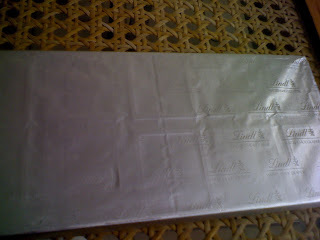 Back to the chocolate torte, I love chocolates! Found a housemate who equally adores chocolate. In fact, she's a chocolate freak and have to remind herself from time to time to 'replace chocolates with fruits'. Having come to Adelaide, I've been to 4 different chocolate houses in just under 4 months. Considered myself lucky to have really nice housemates and they've got car. So, they practically drive us around to places of interest and places with good food. They were nice enough to offer me and Aaron fine dines in high-end restaurant on his Birthday. 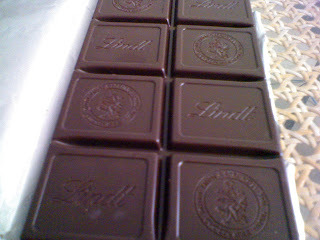 The boyfriend paid for the birthday dinner and the girlfriend paid for our cuppa chocolates in Bracegirdle. What more can I ask for besides getting a job ASAP? I really wanna treat them but I'm on mum and pap's money so times could be hard sometimes. Why am I swaying again! Alright, I made these last year. The recipe is taken from non other than Exclusively Food. Some closer to me will know I love this website let it be a savory meal or a small sweet treats. 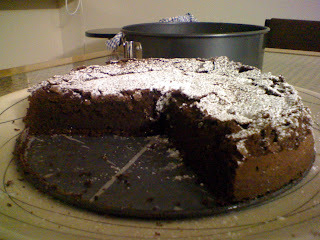 The recipe is here and the torte is really easy to put together. All you need is good quality ingredients and that makes the whole lot of difference. 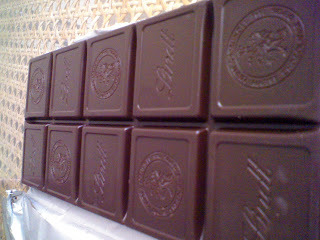 Fresh eggs, good butter, good quality chocolates and even good vanilla paste. 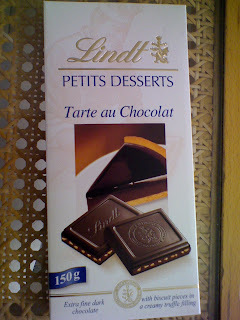 I usually will use 85% Lindt's Dark Chocolates for tortes and flourless cakes but these little Lindt's Chocolate with nougatine bits were on sales on Boxing Day so I thought why not. This was dense and heavy, almost tasted like flourless; only a gluten-allergic person could tell the difference. It has the fudgy feeling and will melt in your mouth given time. 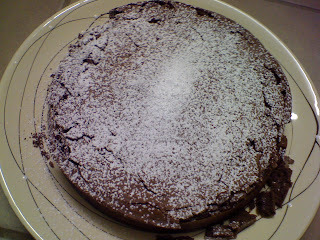 I like my tortes and flourless really cracky on top. I I'll usually press the top of the cake with my fingers when it's cooled to give it that rustic look. I'll then give it a generous dusting of icing mixture. 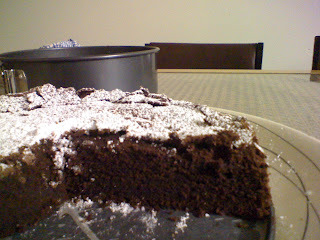 It's yummy, try it if you need a fail-proof look cake for an occasion! Disciplining myself to study at my own pace and be all prepared when it's time for exam is killing me. My hands itched to whip up something in the kitchen to soothe myself and as a matter of fact, I did. But I couldn't even spare some time out to blog about it. I have so many unblogged posts of stuffs I've made when I was in Melbourne and now that I am in Adelaide, I thought we could give way for this little sweethearts to surface first. I made this in Adelaide but lost track of the exact date. I made this on my own with no source whats over and yeah, it's really smooth and yummy. Just a couple of notice though, if you were to turn it out just for that extra 'woah-look', always remember to grease your mould well. When just removed from the refrigerator, let it sit in hot water for 20secs or so and loosen up the edges with thin blade knife and gently flip it. Recipe as below and it makes 2 -1 cup capacity to serve 2 people. But I made these to serve 2 couples. Pretty sweet for Valentine's and for guys whom wanna impress their female spouse since it's pretty easy. I reckon the only tough part about this is caramelizing the sugar. Generously grease 2 oven safe cups each of 1 cup capacity and set aside into a larger roasting pan (Yes, we'll be doing a water bath!). Use 1/3 cuppa sugar from the 2/3 cup and place it in a non-stick milk pot. Add 2 tbsp of the water into the pan and swirl it. Caramelize it over medium low heat until sugar turns a dark amber rich colour. It is okay to swirl the pan but never never stir it. Quickly pour out the caramelized sugar into the greased cups evenly and scrap every last bit from the pot with a silicone spatula. Swirl the cups so it coat the sides of the cup as well. 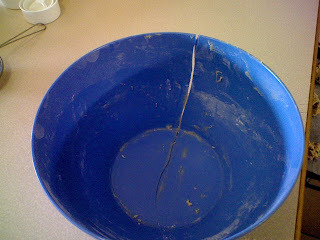 No worries bout the hardened sugar and thinking you'll have a hard time scrubbing your pot! Pour in all the fresh milk in to the same pot and scald it until you see steam escapes profusely from the surface of the milk. Remove from heat. Stir well so all the leftover caramel is thoroughly infused into milk. Now, le it cool a lil while you whisk together the remaining 1/3 cuppa sugar with the whole eggs, the egg yolks and the vanilla. Whish until sugar sorta dissolves. Temper the egg mixture with the milk mixture. Pour boiling water into rasting pan until it comes halfway up the cups and send it straight into the preheated oven for 30mins or until set when pierced through with a knife at the centre. 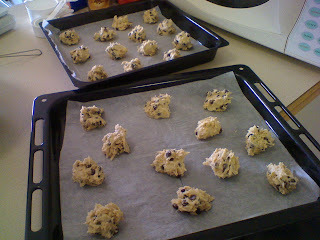 Remove from oven and cool down to room temperature. Chill in the fridge until set (I did 4 hours). Serve straight or do the fancy thing. Good nigth everyone and enjoy the sugar rush!